In 2012, SCDigest editor Dan Gilmore released his latest list of "Supply Chain Megatrends," which contained two related trends: one on how a variety of technologies, from RFID to GPS to mobility and more, will lead to extremely high levels of supply chain visibility, and then in turn how that level of visibility will lead to a level of control that will deliver (almost) perfect logistics. A new product has been introduced to the market that seems to also support this theme. In fact, Gilmore says, why would parcel carriers even bother to deliver a package that is known to have been mishandled, at least for certain product categories? Cambridge Consultants, headquartered in the United Kingdom with US offices in Massachusetts (Cambridge and Cambridge, naturally enough), announced last week an interesting new product designed to track whether a parcel has been roughly handled on its way from e-tailer to consumer. Called the "DropTag," the device combines sensors with a smart phone application to determine if the parcel has been dropped or roughly handled during shipment. Why is this needed? While most merchants will certainly accept a return of a product that has been damaged in shipment, that means the consumer has to go through the hassle of managing the return shipment (and sometimes paying for it), possibly calling to get a returned merchandise authorization (RMA), and other hassles. With the DropTag, the recipient could see that there was rough handling during shipment, and refuse the delivery right there, avoiding the headache of managing the return. Few consumers today actually open the package before accepting the shipment to see if there has been damage, and for many products that visual inspection can't even detect the damage. The DropTag combines a battery, a low-energy Bluetooth transmitter, an accelerometer and a memory chip. The accelerometer measures if the package was subject to any G-forces above some pre-determined level. When the package arrived, the consumer would turn on Bluetooth, "connect" to the package with the phone app, and check the status. It appears that right now, the DropTag simply provides a binary indication of whether the parcel was mistreated. But Cambridge says it developing the sensor platform further to log critical event data so that, when DropTag is interrogated, it can provide information on exactly what happened to the package and when. The company is also exploring how the addition of other sensors could boost its potential applications - for example, adding temperature sensing for 'cold-chain' storage and distribution in the pharmaceutical and food industries. With the large increase in home delivery of both medicines and food items, that information could be quite useful to consumers, who really today have no idea what temperatures the parcels they received were subject to on way to their homes. Cambridge says the "bill of material" for the device will come in under $2.00. Assuming a normal mark-up, that says the DropTag could probably be purchased for something like $2.50 each. That will likely drop over time if volume ramps, and it would seem natural that e-tailers would find some way to re-use the tags, as the company says the coin battery will last for "many weeks." Cambridge, which says it "specialises in developing low-cost, low-power connected devices," has filed patents for the DropTag but doesn't have anyone using the technology yet. Whether DropTag will take off, who knows, but SCDigest thinks it is just another example of the move towards Perfect Logistics. "Think about it," says SCDigest Dan Gilmore. "If you can measure it, you can manage it. If there are very many parcels that are refused based on this data, it will put huge pressure on the parcel carriers to find ways to limit the number of packages that are dropped or jolted." "Wouldn't the carrier want that information first so it doesn't deliver a package the customer is going to refuse? Especially for things like electronics, where you can't just visually inspect the product. Or if a medicine has been exposed to high or freezing temperatures - the customer just isn't going to accept that, and you would know that before driving to the home." Cambridge notes this potential, saying that the DropTag has a maximum range of about 50 meters indoors. 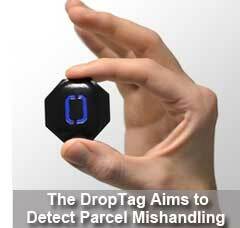 As a result, DropTags "can be remotely interrogated at any stage of the delivery process - as a parcel is moved around a warehouse or carried in the back of a van, smart handsets could remotely and automatically check the package at each stage of its journey - reporting the status back to headquarters and so allowing an early proactive response to any incident." Is there a future for the DropTag? Let us know your thoughts on this new product at the Feedback button below (email) or the Feedback section (web form).